Ok, momma. Tell me if my home sounds at all like yours; I pick my sons up from school or practice eager to hear all about their day only to get one-word responses. Everything was good. School was fine. Oh, but they have no problem talking about Fortnight or the latest football game. UGH!!! You have been away from me for hours, and you have NOTHING to say about your day. Beneath my desire for details is really a momma hoping they would tell me the good things and the hard things. A momma who is silently pleading, don’t shut me out behind her smile. A momma who knows these moments are fleeting. But as much as I want them to talk in those moments, I have learned to create other opportunities for quality communication. It’s important to me to ask the right questions if I want them to be open and share. When they do, my responsibility is to listen and provide space where they know their voice matters. With these three questions, I learn about the heart and desires of my fellas. These questions help our sons learn how to communicate and create a willingness to let others in. These questions don’t guarantee they will talk in the moment. Nope. Sometimes they don’t have much to say right away, but it starts them thinking. 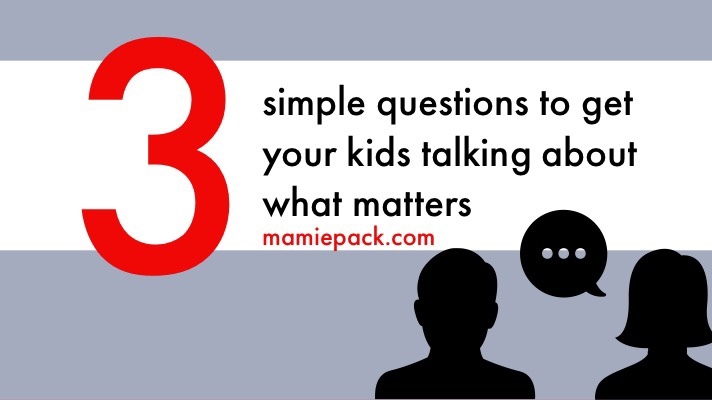 These simple questions help our sons to feel comfortable talking with us, helps build their sense of security, and plants the seeds for open communication. So let’s talk about those three questions. 1. How can I pray for you? As children grow, they start to think they should be able to deal with issues on their own. They may not share how they felt anxious about their test, disappointed about not making the team, or sad for no reason. They may not understand their emotions at all. When something may be bothering them, something they may be struggling with on their own, asking how we can pray for them can be the barrier breaker needed for them to open up. “Asking can I pray for you?” shows our children the power of prayer is not reserved only for the hard times in life. Yes, we can pray about walking through the difficult things, but we can also teach them about praying for wisdom or guidance. We can model for our children how to pray for others and encourage them to do the same for others. 2. What are you dreaming about? Every kid has a dream about who he wants to become when he grows up. Listening to what your kid is dreaming about is a great way to learn about their interests, encourage their dreams, and how to challenge them to step outside of their comfort zones. When we talk to our kids about their dreams, we can learn about ways to encourage them to pursue their purpose in Christ. We want them to dream, but we also want to teach them about the importance of seeking God’s will in that dream. The more I listen to what our children are dreaming; I can go to God for guidance on how to help our children move forward in their purpose. I listen to find ways to encourage their interests even if I don’t understand it or have any interest in it. I want our sons willing to dream big and do the work. Don’t let the world to miss out on the precious gift God has placed in your kid. Encourage your kid to seek ALL God has in store for him. When our boys were little, it was easy for me to jump in to help only to hear them say “I can do it, mommy.” As much as I want to help, teaching our sons HOW to ask for help was just as important. Knowing how to ask for help and understanding what they need is a skill they will use long after they leave our home. Using this one simple question guides them in learning how to ask for help and how to receive help. Let’s be real! Asking for help can be a challenge for us as moms, so just think of how it feels for our kids. How I respond when our sons do ask for help is KEY!!!! Be careful not to say things like, “It’s about time you asked,” “I don’t know why you didn’t ask sooner,” or “You couldn’t do this.” Any negative response to our kids asking for help can hinder them from reaching out in the future. Try these three questions out for yourself. See how it works and let me know what you would add to the list. I can always use more help! This is such an important post! Glad someone is writing about important topics like this. These suggestions are great. And asking specific questions on things we know about already that they’re involved in is a good idea. When a mum offers to pray or help, and actually does, it strengthens the bond with their child. The feeling that mum is a friend and ally doesn’t hurt at all. These are great questions that I don’t ask my kids often enough. Thanks for the reminder! Sometimes I take for granted that I’m with my kids all day long because we homeschool, but that still doesn’t mean that I’m party to every thought that passes through their heads. I totally relate to being the mum who’s desperately pleading not to be shut out! So true!! I love how these questions are open ended rather than yes or no. I often ask if they need help or if they would like me to pray for them, but now I see that can be limiting. I can get to know my children better by simply reframing the questions. Reframing questions definitely helps out quite a bit. I love these questions, especially with a child who is shy and not keen on communicating. Thank you for sharing. Yes. Being an extroverted mom, I want to talk. So when my boys are reserved it can be hard. Just keep talking and creating the space. Your first paragraph happens to me every time I pick my son up!! These are great questions, I really like “What are you dreaming about?”. I think that one is a great opening to talk about the future. Thanks Sharon! Talking about their dreams can be so much fun. Plus we can use it to help with library visits and even some family outings to explore areas they are interested in. Thank you for this post. I’ve been having trouble with my younger son. He doesn’t want to talk much these days. We are a Christian family and these techniques and questions you have listed may help me break through this barrier of no conversation. Thank you again for this post. Oh, I can relate. Getting our sons to open up can be a challenge. That’s why I try to get creative. Don’t be afraid to step outside your box. I’ll definitely try it. Thank you. These are great questions to help our kids open up more. Thank you! I love these, I always ask my daughter if I can help her when I see she’s struggling with something. She’s only 2, so it’s usually a cute little “yeah” and she hands me whatever it is. Awwww, I remember that age with my fellas. Such a precious time when they are still dependent but wanting independence. I especially like that you added the question about asking how we can help our kids. My kids sometimes can get really frustrated about things and not ask for help. I’m constantly reminding them that I’m here to help if they are having trouble solving something on their own! Good job momma! Just letting them know we are here when they need us is something that will stick with them even as they grow older. I have never thought to ask 2/3 of these questions but I’m definitely going to start! These is really great info! So many parents struggle with this issue and these questions will be a wonderful tool for them to open up their conversations! Oh, I am glad you enjoyed the post. We can each learn from each other. The ‘How can I pray for you?’ question is such a great one! I am going to start asking these ASAP. I love the how can I pray for you, and the explanation that God is not just a God of hard times but of ALL times. This is awesome! Yay!!!! Would love to know how it goes for you. Those are such important questions. They really dig deep into the route of the issues they may be facing. Yes! We all can use help to develop healthy conversations with our kids. What a great article! My little one may be too little for these thoughts now, but I will start early to get his little mind thinking! Especially the praying one, never to early for that! Absolutely Katie! It’s never too early to start, especially prayer. I love the dreaming question! It really gives an insight into their subconscious! Yes it does. Talking to our kids about their dreams and hopes for the future helps them to think long term. I love these so much!! Will definitely be trying. My favorite is what are you dreaming about?! That is one of my favorites too!